QEII chose Globe-Trotter for her honeymoon luggage; the 18" attaché served as Churchill's Despatch Case during his time as Chancellor of the Exchequer; and the late, great globe trotter Sir Edmond Hilary took this brand of case to base camp on Everest in 1951. If it's good enough for the likes of them, it's good enough for me. I think I may have to make good on my Anglophiliac urges and treat myself to the 9" mini utility case, which, compared to Goyard and Vuitton prices almost seems like a steal at GBP210 (even with the pathetic, anemic dollar). 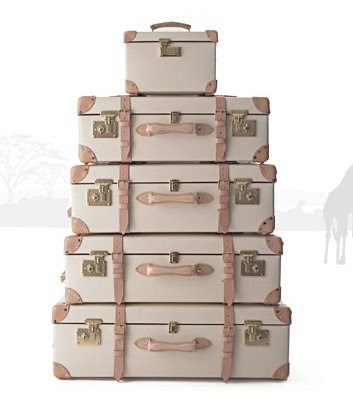 The top ivory stack comes from the Safari collection, while the red and tan belong to the Centenary, a colorful collection launched in 1997 to commemorate the first 100 years in the business of traveling fabulously. Just about a month late . . . would have come in handy on my trip to Marrakesh -- very practical. I thought the ivory stack was very Sheltering Sky. I can't decide which colorway I prefer. Both are lust-worthy. How about the lacquered red ones! Wow! Carry on, never, ever check... I would love one of these as they truly reflect the all-but-gone elegance of travel. That's the Oriental, right? Aren't they amazing! It's such a rich color. Yes, it is. If I didn't have to pay off my tailoring bill and rebuild two of the chimneys on the house, I'd be carrying one of these on our trip to the City. Or any of them, who am I kidding! How would you choose? And at that price, I'd have to. 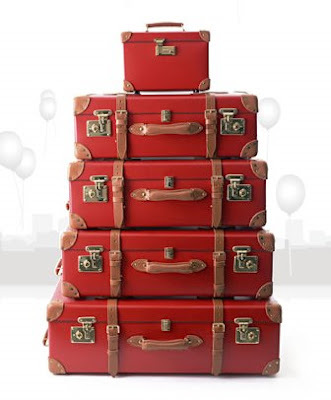 just ordered four suitcases from the centenary collection in orange - i can't wait to use them on my travels! 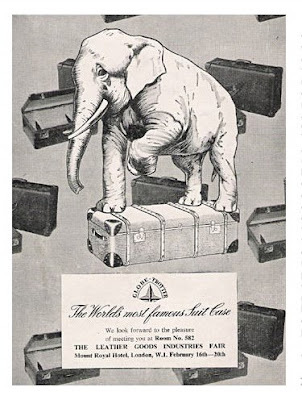 Globetrotter luggage is purely decorative. Unless you plan to have it placed in a private jet by a porter with white gloves, be prepared for it to break and leak. Times have changed since 1897. I ordered two large cases directly from the London store: one for myself and one as a gift. The case I purchased as a gift split in half the first time it was used. When I called the store in London to see about a replacement, the person I spoke with was rude and refused to take any responsibility. In the unlikely event that a Louis Vuitton bag split the first time it was used, I would have received an apology and a new case. While I travel quite frequently for business and pleasure, I rarely use my case because I do not trust it. The last time I used it, I opened it in my hotel and found that water had leaked in and there was a glue-type substance all over my clothing.